Home Amazing He's a Christmas corker! 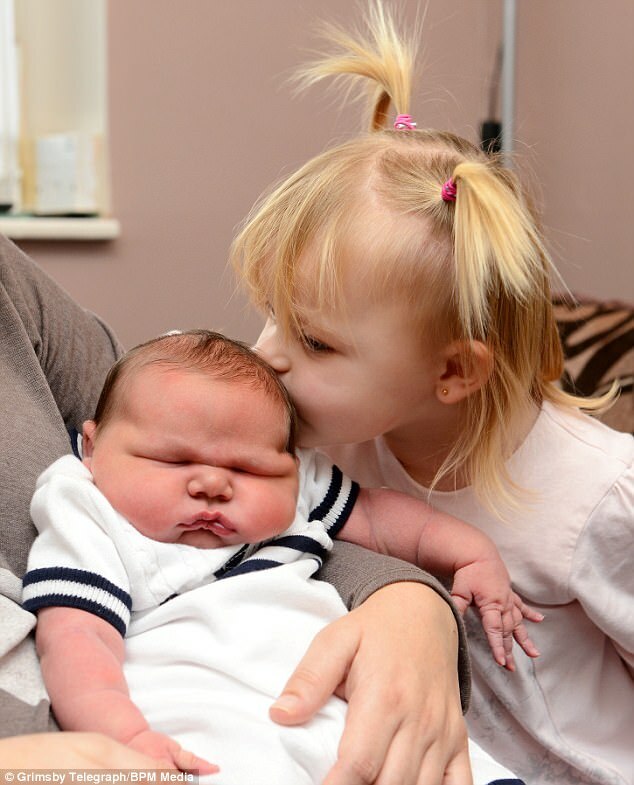 12lb baby is the biggest to be born at a hospital in a decade (but he doesn't seem too chuffed. with the honour) . He's a Christmas corker! 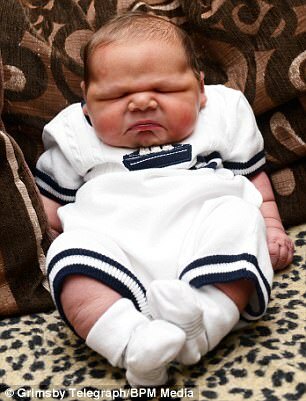 12lb baby is the biggest to be born at a hospital in a decade (but he doesn't seem too chuffed. with the honour) . 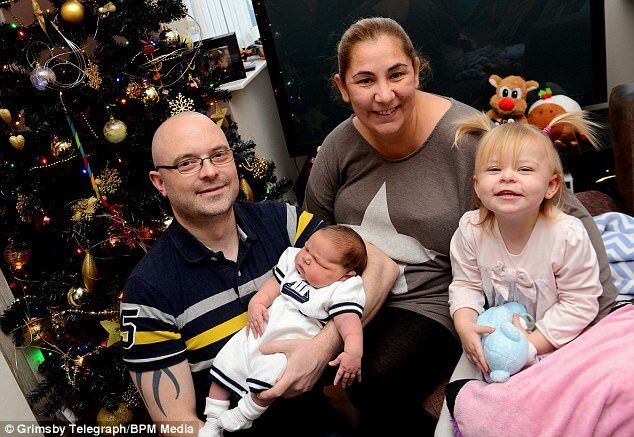 The family of the heaviest baby born at a hospital in a decade, tipping the scales nearly 13lb, is celebrating his arrival just in time for Christmas. Brodey Young was born on Tuesday morning on the Blueberry Ward at Diana, Princess of Wales Hospital in Grimsby. He weighed in at 12lb 130z - nearly the same as a bowling bowl, stunning midwives, doctors and his mother Sheralyn Wilcock. The mother-of-three, of Cleethorpes, said: 'I felt light and I could feel the difference in pressure when he was coming out. Ms Wilcock said there were no abnormalities during her pregnancy that suggested Brodey would be so heavy, but explained that her other two children, Bailey Hemsley and Payton Young, were also larger than anticipated when they were born. Bailey, now 18, weighed 10lbs 2oz and two-year-old Payton weighed over 8lbs 15oz when she was delivered. Despite only being a few days old, Brodey is already filling his zero to three-months babygrows and is drinking 70ml of milk every three or four hours. The average for a new-born is between 20ml and 40ml. Ms Wilcock , who was supported during her cesarean delivery by partner Robert Young, added: 'The pregnancy itself was all textbook. I have had big births before. 'The midwife estimated that Brodey would weigh between 9lbs and 12lbs and they were absolutely spot on. A spokesman at the Northern Lincolnshire and Goole NHS Trust confirmed Brodey was the heaviest baby born at Grimsby hospital in the past ten years. The previous record of the decade was a 12lbs 3oz baby born in 2014. The parents say they are just happy that Brodey, who measured 63cm when he was born, is healthy and has been delivered in time for Christmas. Ms Wilcock added: 'He was four days early and I had to go in for cesarean, which was quite daunting because I had never had one before. 'They told us it had to be cesarean because otherwise it can get quite dangerous. She added: 'The whole team at the hospital from the surgeons, midwives, nurses were all excellent.